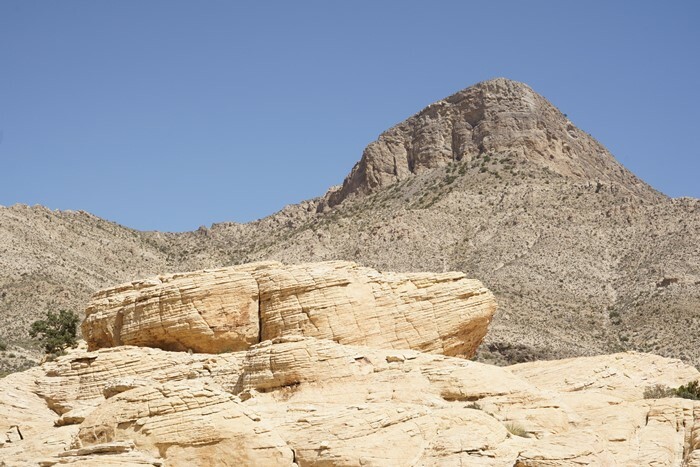 No matter where you are in Red Rock Canyon, Turtlehead Peak is there, watching you, tempting you to climb it. This distinctive mountain is noticeable from just about every corner of the park. And after you’ve stared at it for a while, you might decide you’re ready to conquer it. 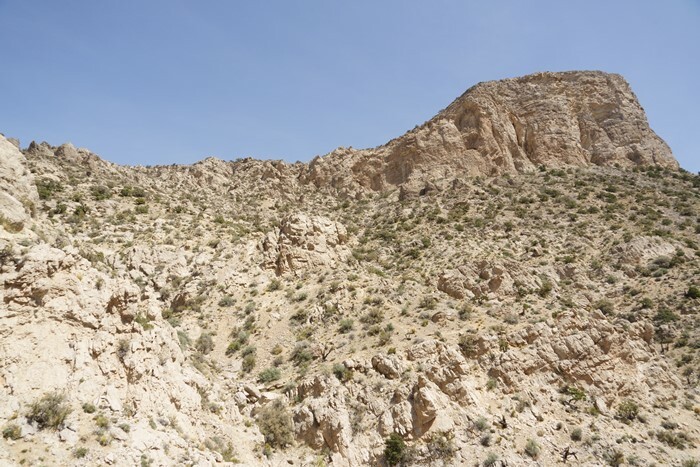 The hike isn’t short, it isn’t shady, and it isn’t quick, but Turtlehead Peak is the easiest peak in the park to summit. 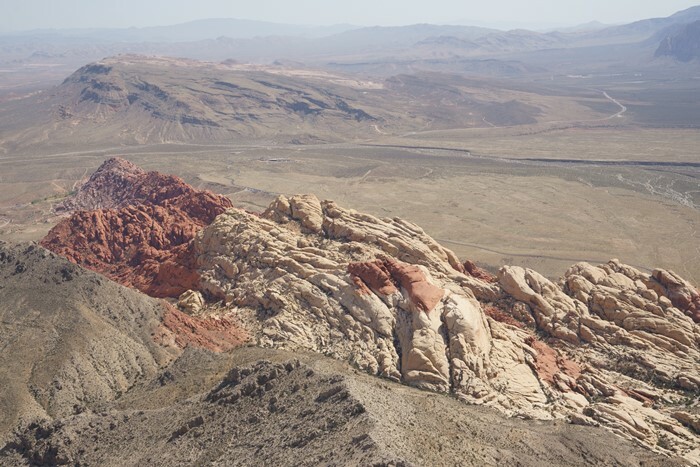 If you’re in reasonably good shape, and you have a few hours to spare, you’ll be rewarded with an unparalleled view of the entire park, and all of Las Vegas. 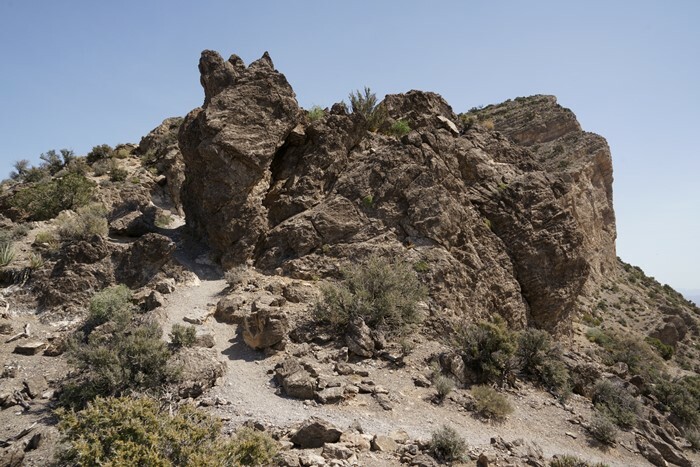 The trailhead for Turtlehead Peak is the same as Calico Tanks. Park at the Sandstone Quarry parking area, roughly 3 miles into the scenic drive. 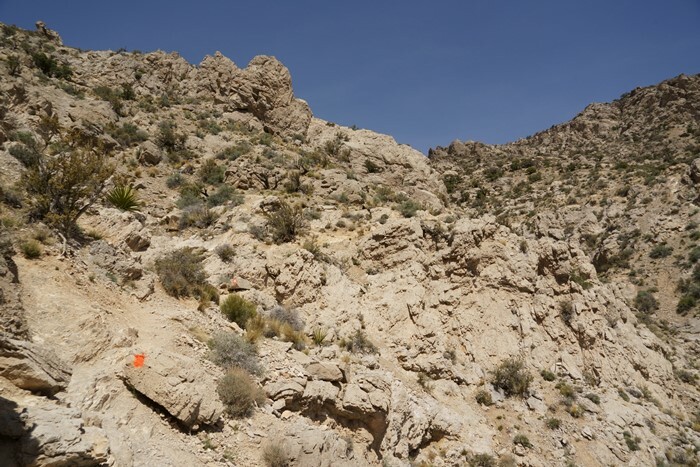 As you start up the path towards Turtlehead Peak, you can see exactly where you’re headed, although it’s not exactly obvious how you’re going to get there. 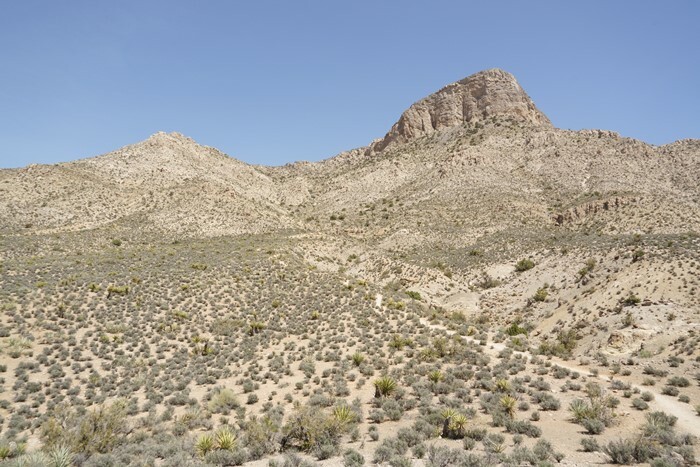 The hike to Turtlehead Peak is 2.5 miles, one way, and it gains roughly 2,000 feet (600 meters). Fortunately, the first part of the hike is pretty easy, but then, it gets really hard, really fast. … and then you’ll cross the open desert. At this point, the trail below your feet is obvious, but the path up the mountain is still obscure. And the truth is, even once you’re climbing, it’s hard to follow the trail. But at this point, all you need to know is that you’re headed towards that saddle between Turtlehead Peak (on the right) and a smaller hill (on the left). 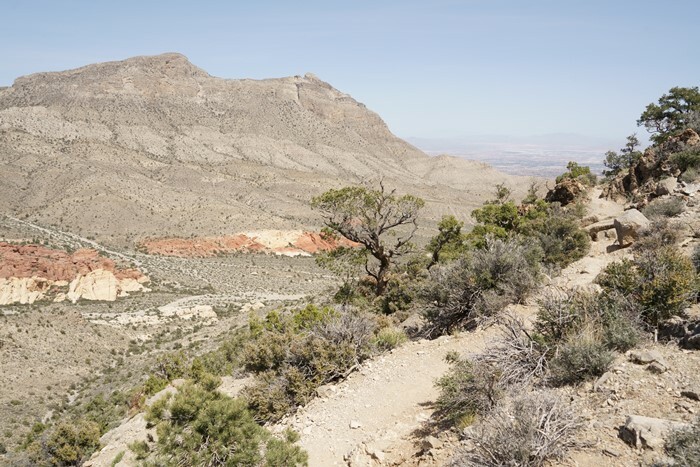 Once you reach the saddle, the trail curves around the backside of the mountain, and climbs up the slant — sort of like climbing up a roof on top of a very big house. As you start to gain elevation, the views begin to reveal themselves. This looks back in the direction where you started. 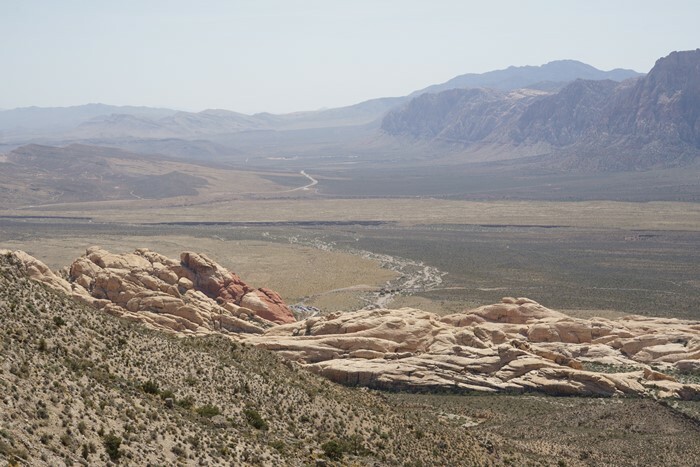 Those petrified sand dunes make up the Calico Hills, and the Calico Tanks are nestled in the middle somewhere. Getting closer to the mountain, the trail still isn’t obvious. This part is not going to be a smooth hike — you’ll be twisting around rocks and dodging brush as you push forward. The park has made an effort to blaze the trail up the hill. Look closely, and you can see some very unattractive fluorescent orange paint. These marks are essential to finding your way safely, but all too often, it’s difficult or impossible to spot the next one. At times, I was completely baffled whether the markings were telling me to go left, right, or up. I saw a few other people on this hike, and they appeared to be just as confused as I was. Some of them were far off the path that I was taking, and I have no idea whether any of us were making the right decisions. It’s also worth mentioning that at this point, the trail isn’t just confusing, and it’s not just incredibly steep, it’s also very sunny. You won’t find any shade, anywhere. 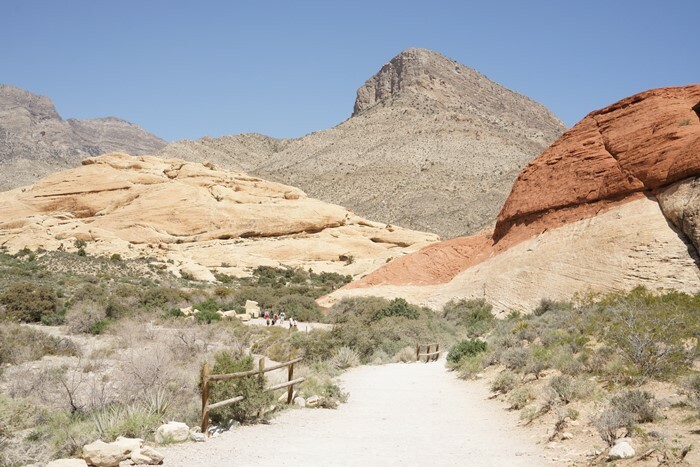 I was hiking this trail in early April when the weather was still quite pleasant by Las Vegas standards. I can’t imagine the torture of climbing Turtlehead Peak in July. At the saddle, you almost lose your view of the mountain behind some smaller rocks. The trail swings around the left side of this jumble, and you’ll have some moderate ups and downs before the final push to the top begins. At the saddle, you’ll catch your first glimpse of the valley on the other side of Turtlehead Peak. Looking north in the middle of the day, the sandstone outcroppings are quite beautifully lit. You can enjoy that view as you trudge up the final stretch. The trail up the backside towards Turtlehead Peak is not very interesting, but it is very tiring. Thankfully the reward is just ahead. … and you can see the Las Vegas skyline. This big city looks quite tiny from up here. 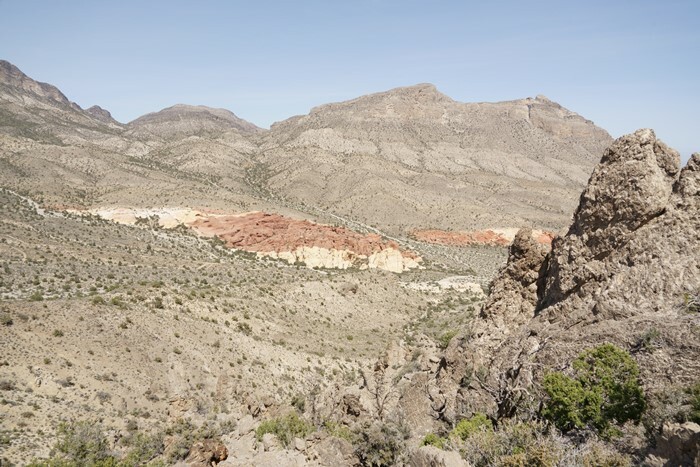 The Calico Hills can be seen to the south, along with parts of the park’s scenic loop road. Find a smooth rock, have a seat, and enjoy the view for a while. You earned it. 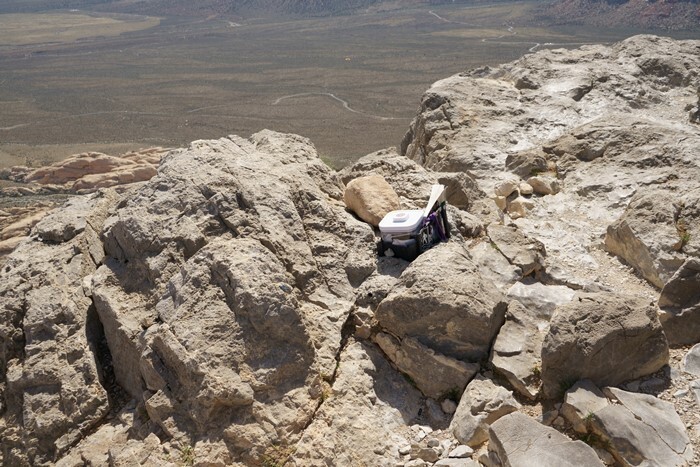 While you’re at the top of Turtlehead Peak, watch for a plastic container that holds some notepads. You can record your presence and leave a note about what you think of the area. I also found a book of poetry stashed nearby. It was truly awful poetry, but at least the view was nice. The hike down was slightly easier than the trip up, but it was still challenging. The trail blazes were easier to follow, but I still think I got off-track once or twice. You also need to be cautious of loose gravel as gravity pushes you downhill. But, the return trip should be easier and quicker than the climb. 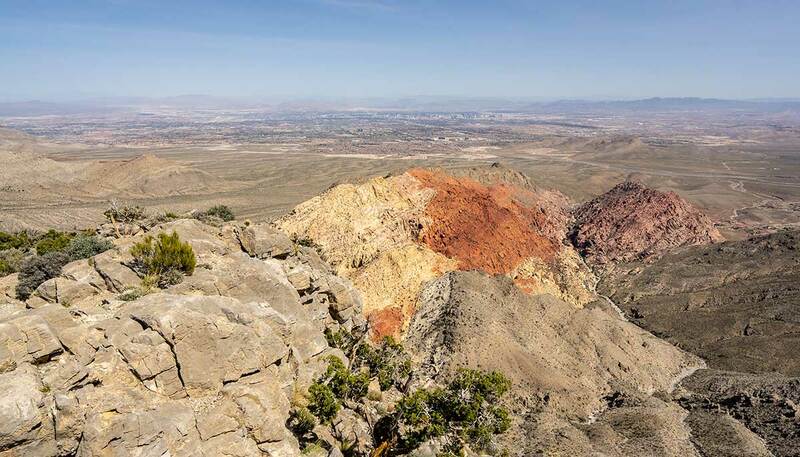 Turtlehead Peak offers an excellent half-day hike to one of the best viewpoints in Red Rock Canyon. 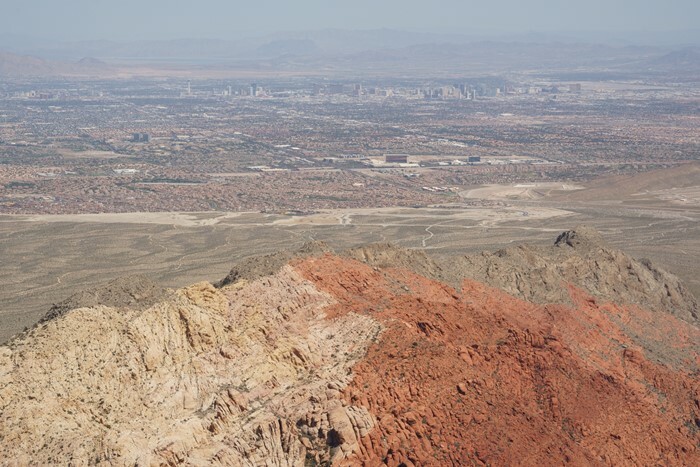 You’ll enjoy a great view of the Calico Hills and all of the park, as well as the entire Las Vegas valley. Be aware that the trail is hot, sunny, and hard to follow in places.